Minimize contact with toxic people. You know the folks — the ones who, through their actions or words, either intentionally or unintentionally, thrive off of making others feel miserable? Yeah. Them. If you find yourself constantly being hurt by the same person, you might need to establish better boundaries. Caller ID can help you avoid spending time talking to your toxic person. And if you know Cruella McRude is going to be at a particular social function, decide how much you really want to attend. Don’t be like me and keep waiting for friends and family members to rescue you. Learn to protect yourself. While there are manipulative, difficult (even pathological) personalities out there, you owe it to yourself to self-improve. You can’t change toxic people, so stop trying. Take an inventory of the people in your life and spend your time with the loving, nurturing people — and set limits with emotional vampires. Don’t be afraid to throw out your kid’s papers. As a person who used to work as a professional organizer, I have seen firsthand what happens when people attempt to stash everything in the basement. When something comes home from school, ask yourself: Does every kid in the class have this exact same thing? I don’t care if your kid’s math worksheet has a sticker that says “Great Job!” at the top. Pitch it. If your child scribbles 473 drawings of the dog every day, pick your favorite one, and throw away the rest. Designate ONE large bin for each child. At the end of each year, go through these bins and be even more ruthless, keeping only the best. That said, be sure to display a few items. 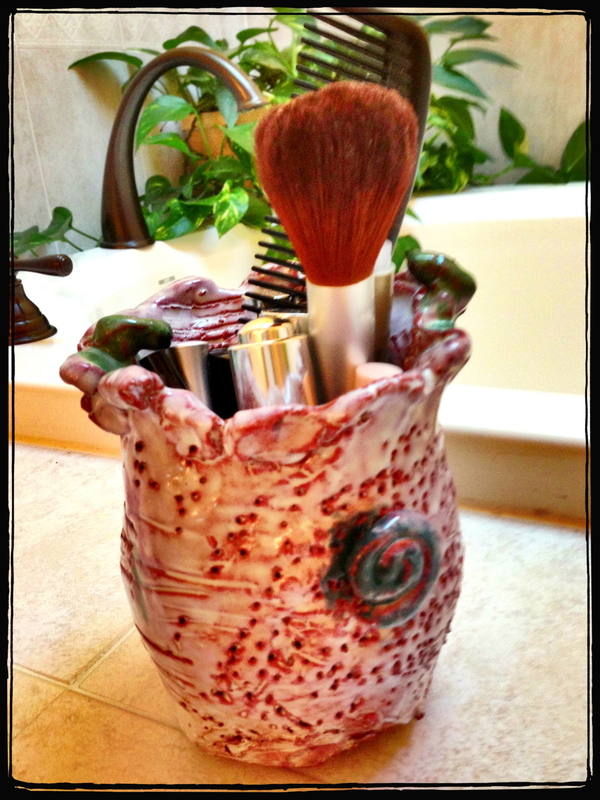 The tall ceramic vase my son made (that doesn’t hold water) lives on my bathroom counter and keeps all my lip plumpers and makeup brushes. I love it. If it ever broke, of course, I would be sad. But my son knows that I truly love his work because I honor it by using it every day! Children’s art is fabulous because it makes a house feel like a home. And every home should be infused with a little whimsy. I recently wrote about how my favorite hair care product is being discontinued. After strenuous testing, I have found a replacement! 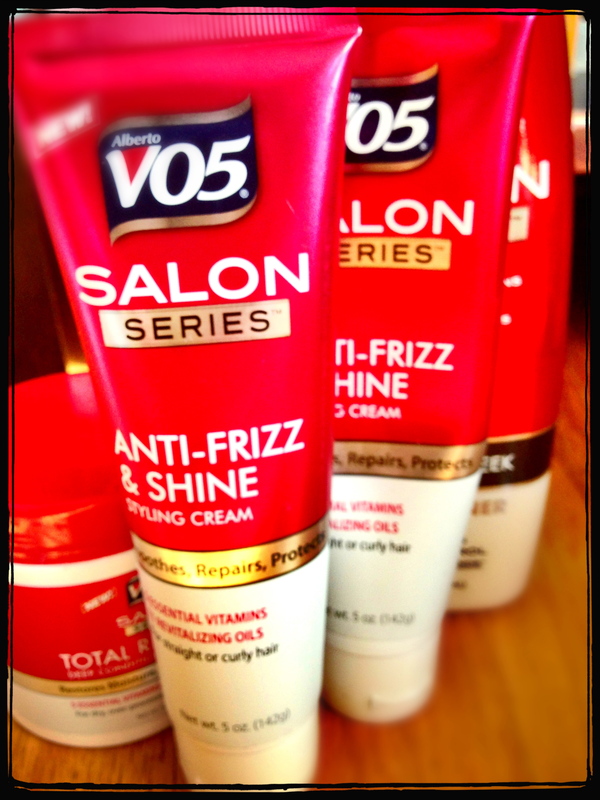 Believe it or not, Alberto VO5 has a new Salon Series line of products that totally work for curly girlies. Their Anti-Frizz & Shine Styling Cream is incredible! I’ve been using this product for 2 months now, and it is better than any other, more expensive product I’ve tried. It tames my curls without making my hair crunchy or greasy. I spread a quarter-sized amount on my wet hair after shampooing and conditioning. Believe it or not, it holds so well, my hair usually looks even better the day after I’ve washed it, so I don’t even have to fuss at all! The only bummer is that this product isn’t widely available in stores yet, so right now I have to order it from soap.com. I don’t care. I was already ordering my old stuff online — and I like the results from VO5 even better. After 30 years of being completely brand loyal, I can’t even believe I just wrote those words. But it’s true. Check out her pics on Instagram.